This article is about Wario-Man's boss microgame. For the record from WarioWare: Twisted!, see Wario de Mambo (souvenir). Info "I'm a dancing machine!" 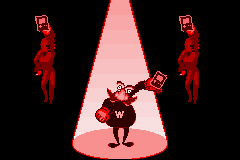 Wario Mambo is Wario-Man's boss microgame in WarioWare: Twisted!. In this game, a person resembling Wario is seen dancing with two women in the background. The game's purpose is to memorize the ladies' moves and make the Wario-looking person perform them. The player also has to follow the rhythm exactly to continue until the end. If the player misses one single move, they lose. Some of the move sequences for levels 2 and 3 in the Japanese version differ from the American version. 1st level difficulty: The "Wario de Mambo" theme is instrumental and there is a small amount of moves. 2nd level difficulty: The "Wario de Mambo" theme is sung and there are more moves to perform. 3rd level difficulty: The "Wario de Mambo" theme is sung and there are a large amount of moves. Wario de MAMBO, Wario de nanbo? Wario de MAMBO, nya nya nyaaa nya nya! Nya nya nyaaa nya nya! This page was last edited on January 13, 2019, at 01:17.